When I am told facebook is a free, I ask is it a charity? No, facebook is not a charity, it is a rapacious global corporation. When something appears to be free, it is you who is the product being sold. In the case of facebook, it is your personal information that is being sold. Facebook only exists because you provide the content, only you do not get paid for doing so, you work for free. Instagram is owned by facebook. Every picture you post, they reserve the right to use your pictures, you will never be told, you will not get paid. When a friend angrily complained that I had shared her pictures, she was correct to be angry that I had not obtained her consent. But wrong to be angry that her pictures were now available for the world to see, they already were, she had posted them on facebook. 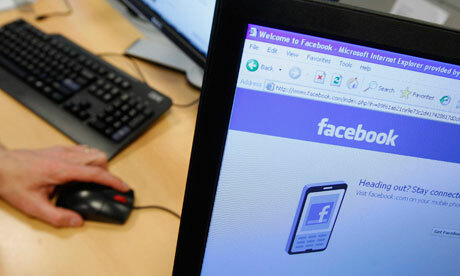 If you do not want your personal information to be shared, then do not post on facebook. If a stranger stopped you in the street you would not hand over your personal information, why therefore post it on facebook for all the world to see? It is not only your personal information facebook is stealing, abusing, selling. It is also the communications, who your are networked with. What are known as externalities. Information is one of the most valuable commodities. We lock away our valuables in a safe place. Why do we not treat our information in the same way? What we need is an open coop social media platform owned by the users. The web and the internet were designed to be free. Free as a global information commons, we contribute information, we draw upon that information. It was not intended as a pool to abuse unsuspecting users. Facebook has been experimenting on is users, by changing their news feeds to happy or unhappy content (determined by keywords) and seeing how they reacted, how those they were connected to reacted. I stick my hand up her. Many moons ago, I experimented, or was part of a unit, that experimented on people. It is a basic tenet of scientific research, that you have to have informed consent to experiment on people. This is known as the Nuremberg Code. In the US, Common Rule, research subjects must give their consent before they’re included in an experiment, and then agree to it and have the option not to grant consent without being penalised. We have learnt to expect no better from facebook, they having nothing but contempt for users, their privacy and personal data. But we should expect better from the researchers, the authors of the paper, the universities and the journal that published their paper. I was concerned, until I queried the authors and they said their local institutional review board had approved it—and apparently on the grounds that Facebook apparently manipulates people’s News Feeds all the time… I understand why people have concerns. I think their beef is with Facebook, really, not the research. So, the editor of a reputable journal thought it ok, because an ethics committee of a reputable university thought it ok, because it is what facebook does all the time. So, the fact that it is normal practice for facebook to abuse its uses, makes it ok, to ignore normal ethical standards when carrying out research and publishing the results of that research? Facebook experimented on 689,003 users, manipulating their emotions. What if some were, as statistically they would be, bi-polar, what if the manipulation tipped them over the edge? How many were children? Facebook manipulated its users as laboratory rats. As facebook users know, ethics does not appear in the facebook lexicography. The experiment carried out was one of emotion contagion, how you feel, how does it affect those around you. In India, corrupt politicians are buying news stories. What is to stop facebook, which is one of the least ethical companies around, manipulating its users, as it already has shown it is willing to do so. Facebook has once again shown its arrogant contempt for its users and its scant regard for their privacy. 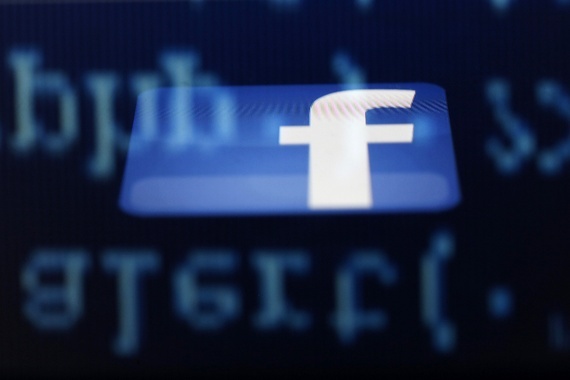 Facebook is accessing private messages between users and selling the data. Once again this clearly demonstrates why you should not put personal information on facebook. Would you to a stranger who stopped you in the street hand over personal information, where you live, where you studied, where you work, who your partner is? If not, then why put on facebook? All you are doing is turning yourself into a cash cow for facebook, increasing the likelihood of being a target for spam and junk, and making yourself an easy target for ID theft or fraud. If you have put personal information on facebook, overwrite with false information. I would urge everyone to delete or overwrite, render the information facebook is collecting on you worthless. User abuse is not restricted to facebook, also includes Instagram. Andrea Stroppa and Carlo De Micheli, the leaders of the group, analysed pages across the network, and identified spam through the use of phrases such as “Hey click here for a free iPhone” followed by links to sites outside the network. But trying to catch and get rid of the spammers is a growing problem for Facebook. The revenue that the spammers – and those running the sites linked to – do not form part of Facebook’s revenue, but instead piggyback on the success of the social network, which now has more than a billion users worldwide. The URLs to the outside sites have their destination hidden by using legitimate link-shortening services such as Tinyurl.com or bit.ly. That also makes it possible for researchers to track the ultimate destination – and figure out how many people click on the link. About 9% of the pages that users were directed to by spammers instead use Google’s AdSense – meaning that Google inadvertently gets a cut from the money being made by the buyers of spam services. That gives a range for the spammers’ earnings of between $87m and $390m – but when they took into account the number of fans of the pages, the weighted average was just over $200m annually. Often the spammers begin by setting up their own “fan pages” and attract human users to them – and then once they have enough Likes on the page they can begin selling links on it to third parties. Stroppa and De Micheli found 20 key sites where spammers congregated offering “black marketing” in which they would contract to post spam links in return for cash. In April, the Italian team uncovered the multimillion-pound business of selling fake Twitter followers, estimating then that as many as 20m were created by spammers and so fake. There, they calculated that Twitter followers were sold in packages – ranging from $1 for 1,000 extra followers, up to $1,000 for a million. They reckoned that made it a business worth between $40m and $360m. In looking into Facebook spam, the researchers found posts offering to sell spam links on Facebook fan pages dating back to 2010. But on the present-day forums, they found spammers’ prices for posting to pages which already had more than 30,000 “Likes” – and so would be likely to show up in peoples’ News feeds, or be regularly visited – varied from $8 to $20. 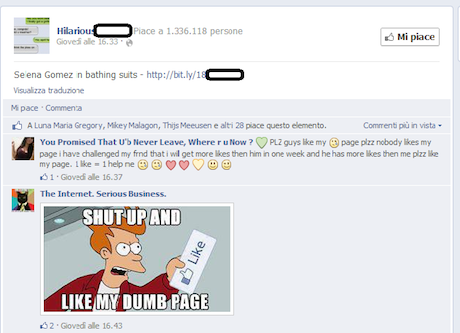 For pages with over 100,000 Likes, the prices ranged from $35 to $100. 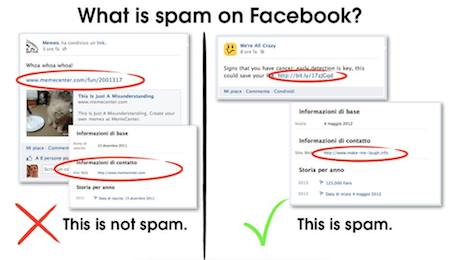 what is spam on facebook? “Third parties pay spammers to post their links on Facebook pages, to reach the largest amount of users possible,” said De Micheli. For the financial model to work, the third parties must be accruing benefits even greater than they are paying the spammers – though it is impossible to know what their rate of return might be. “We notice that it is rather common for the landing page [from a link] to be a product on an e-commerce site made to monetise quickly rather than to generate traffic on a home page,” De Micheli said. “Links to YouTube can be used to generate views, and so money – view generation on YouTube is a fast-growing market.” YouTube offers revenue-sharing arrangements with a number of users. Another outside site identified by the researchers promises that some people who post affiliate links – which pay an intermediary small amounts for clickthroughs to the main site – are getting paid “thousands of dollars per day”. Facebook takes action against spam pages and posts where they are reported by users, but the sheer volume of spam postings could overwhelm its checkers’ ability to crack down on spam. A Facebook spokesperson said: “Protecting the people who use Facebook is a top priority for us, and we have developed a number of automated systems to identify potentially harmful links and stop them from spreading. Those systems quickly spotted these links, and we are working to clear them from the site now. This is just another example of why users should be very wary when using facebook. Facebook is changing its privacy settings yet again, making it difficult to set privacy settings. More and more people are now turning away from facebook, they are sick of being abused for profit and seeing their personal privacy violated for greed. Marc Zuckerberg has become the one person most people would rather not be seen dead with.